This paper was presented at the Toronto Electroacoustic Symposium 2010, during the Cognition, Interpretation and Analysis session, chaired by Michael Kaler. The analysis of electroacoustic music remains in a state of infancy, suffering from a lacuna of analytical tools equipped with a simultaneous clarity and depth to approach this highly diverse and frequently complex music — music that is often devoid of the traditional elements most explored in analysis, namely tonal, harmonic, and formal elements. 1[1. See Licati (2002), Roy (2003), Simoni (2006), Smalley and Camilleri (1998) and Windsor (1995) for discussion and application of several analytical approaches.] While much of the music created in the last 100 years has eschewed traditional notions of form, Wallace Berry’s monograph Structural Functions in Music (1987; reprint of 1976) is a potentially instructive analytical framework for electroacoustic music. An expanded variety of sound possibilities that privileges timbre and texture, and compositional processes that take place via electronic technology rather than manuscript paper present obstacles to the analysis of electroacoustic music. Many works have no scores, having been created in the studio without any prescriptive sketches. The scores that do exist are often limited to graphic representations of pitch, texture, timbre and motion, with few precise or quantifiable indications. This expanded variety of sounds and an increased focus on timbre are challenges to the analyst, whose previously acquired tools for analysis (e.g., Schenkerian and harmonic analyses, set theory, transformational theory) are largely ineffective. Berry’s definition of musical structure as a process, as “the punctuated shaping of time and ‘space’ into lines of growth, decline, and stasis hierarchically ordered” (Berry 1987, 5), and his focus on contextual changes in intensity (i.e., progression and recession) seem applicable to the some electroacoustic repertoire. Calling principally upon his discussion of texture and timbre, this paper is a preliminary application of Berry’s concept of structural functions in music to electroacoustic music. This concept is not based on the notion of form as pattern, but rather as process. This processual framework explores the “principles of contextual shaping” (ibid., 21) found in a given work, regardless of genre, instrumentation or historical period. 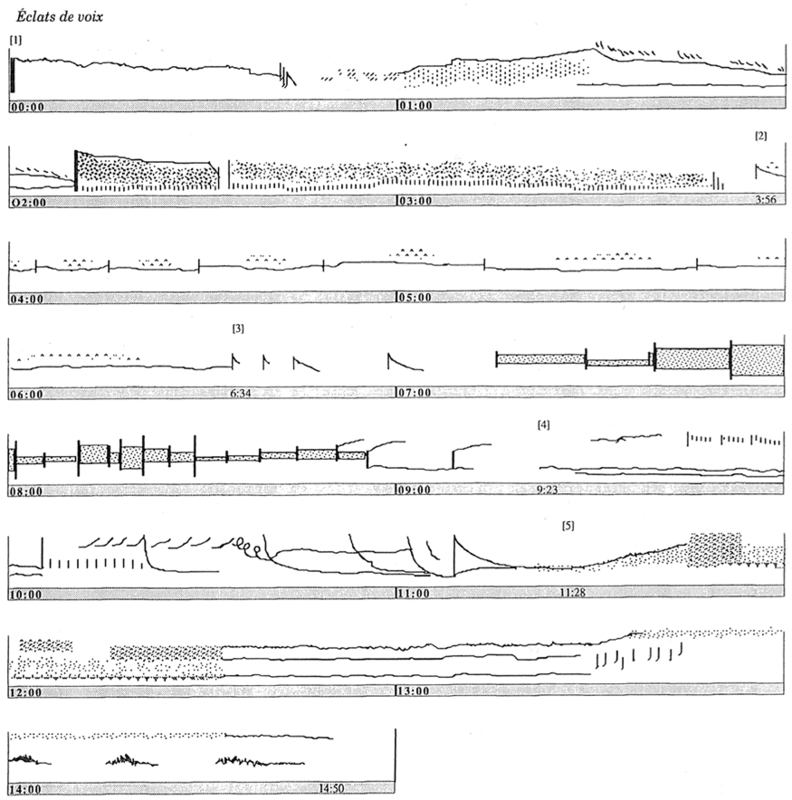 To illustrate Berry’s analytical approach and its applicability to electroacoustic repertoire, acousmatic composer Robert Normandeau’s Onomatopoeias cycle serves as a case study. In 1990, the Quebec composer Robert Normandeau composed Bédé, a work whose sound source explores two of his compositional preoccupations: the voice and onomatopoeias. Normandeau wanted to use the recorded voice to cover the whole sonic register and spectrum without using any other sounds (Normandeau 1992, 57). He felt that onomatopoeias offered expressive potential because they are the “only case in the human language where the action, the gesture or the feeling are directly related to the sounds used to describe them…”. For a source text, Normandeau had the young girl (Marie-Hélène Blain) speak words taken from Le dictionnaire des bruits (1989) by Jean-Claude Trait and Yvon Dulude. Bédé inspired Normandeau to begin a fifteen-minute, five-movement large-scale work entitled Éclats de voix. Following the success of Éclats de voix , Normandeau decided to use the timeline to create more works. The result was a cycle of works entitled Onomatopoeias that explores the recorded human voice at different ages: Éclats de voix (1991) — childhood; Spleen (1993) — adolescence, Le renard et la rose (1995) — adulthood; and Palimpseste (2005) — old age. Normandeau intends that each of the five sections could be stand-alone works for radio broadcast or concert programming. Though each section is distinctive and independent, unity remains across the five sections through the use of the same sound source (the young girl), common textures and processing methods (Berezan 1998, 2). Délire et texture (Frenzy and Texture). Sérénité et texture (Serenity and Texture). The title of the work refers to two main characters from Antoine de Saint-Exupéry’s 1943 novella Le petit prince. Normandeau retains two aspects of Le petit prince for Le renard et la rose: the musical themes associated with particular characters (also based only on vocal sounds) and the actors’ voices. Table 1. Overview of the formal divisions in Robert Normandeau’s Onomatopoeias cycle (1991–2009). This paper references both this overall timeline, which is the foundation of all four works, and individual works that, because of the natural qualities of the variously aged and gendered voices, result in unique sonic impressions. While the pacing — i.e., timeline — of the works remains stable across the cycle, the varied densities, dynamics, coloration, and spatial counterpoint reveal each work’s distinct expressive capacity. In analysis of works by a composer like Normandeau, for whom form is of primary concern, the challenge is to move beyond mere description of the moment by moment sonic events to consider the formal processes: how these moments change, how intensities develop and decline. As Berry explains, “musical structure… can be regarded as the confluence of shaped lines of element succession which either agree (are complimentary) in intensity direction or disagree (are mutually counteractive or compensatory) in direction” (Berry 1987, 9). The analysis provided below focuses on these element-actions, concentrating on the elements of texture, timbre and space as they play out in Normandeau’s Onomatopoeias cycle. 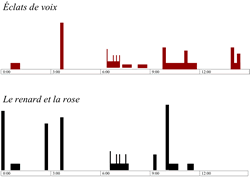 This paper explores two brief case studies: first, how timbral intensity is shaped by the varying conspicuous presence of the human vocal source; second, how textural and spatial processes are experienced through a montage effect of several element-actions in the third section, Colère et dynamique. These case studies are followed by a brief consideration of contrasting small-scale and large-scale formal processes. What drew Normandeau to compose the Onomatopoeias cycle is one particularly interesting and varied timbre: the human voice. The cycle’s only sound source is the human voice; thus in one sense, timbre remains static throughout. But the specific timbres that Normandeau draws out of the recordings of variously aged human voices are diverse and only rarely clearly human. Using Berry’s notion of growth and decline, this analysis equates obvious human sounds with great intensity, and equates inconspicuous sounds with declining (or non-existent) intensities. This section focuses on Éclats de voix, followed by a brief comparison with Le renard et la rose. Éclats de voix, the first work in the cycle, presents few sound sources that are clearly human, highlighting the ongoing tension between referential and abstract sounds in acousmatic music. 2[2. Audio clips of this work can be heard on the empreintes DIGITALes website, along with the other works in the Onomatopoeias cycle.] Most of the conspicuous human sounds are grouped in close temporal proximity: 0:47–1:35, 6:34–7:16, 10:05–11:55, and 13:47–14:00 (Fig. 1). At 3:56, Normandeau introduces the first clearly linguistic utterance (“oups”), creating a surge of timbral intensity. Following this great growth in timbral intensity, the intensity declines rapidly to a period of vocal absence, with minimal discernibly human sounds emerging until early in section three. This relative absence of the human vocal source in Section Two is only perceptual because, as Berezan (1998) outlines, much of the sonic environment in the section is in fact modified material from “oups.” Section three opens with an increase in vocal timbral intensity, with audible mouth sounds and phonemes, but once the timbral and textural activity increases in density, the human sounds become somewhat hidden again. The remainder of the work intermittently breaks the relative absence of conspicuous human sounds. For instance, this absence is briefly broken by two coughs at 10:05 and 11:08. Also, Normandeau recalls some of the vocal timbral intensity in the final section with “oup” at 13:45 and the phoneme “ts” at 14:00. The re-statement of “oup” at 13:45 (which references “oups” from 3:56) becomes a sort of timbral motif. The second utterance is increased in significance because it makes reference to the first. However, the suddenness and clarity of the first “oups” is timbrally more intense; the second statement is less striking in comparison, and thus, while it presents a growth in its immediate context, it declines in timbral intensity from the first statement. 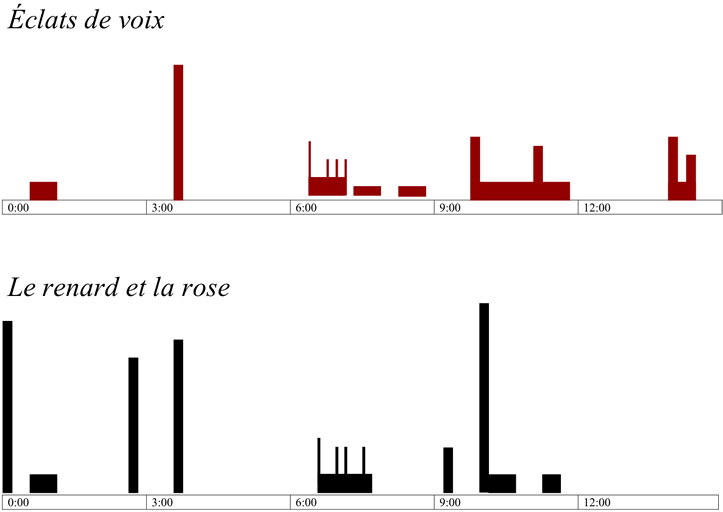 This mapping of the conspicuous vocal timbre offers an interesting comparison to the third work in the cycle, Le renard et la rose. This work has a similar timbral pacing to that found in Éclats de voix, with groupings from 0:49–1:37, 6:42–7:23 and 10:11–10:40. However, one significant exception affects the formal process of the work. For the only time in the entire cycle, Normandeau introduces a clearly human sound in the opening few seconds: laughter. This strong and timbrally intense gesture surfaces again at 2:51, 3:56 and 10:11, thus creating a thematic connection, or timbral motif, across the work. Each recurrence results in greater timbral intensity as laughter is established and reinforced as this timbral motif. Colère et dynamique is one of the most interesting sections of the entire work, due mostly to its great contrast to the other four sections, and especially to its adjacent sections, two and four. This analysis takes particular interest in Berry’s “textural activators,” including dynamics, articulations, and colour; textural intensities do not change based solely on density-numbers, that is, the number of sounding events, but also on these “activators.” In this third section of each work, which is the only section to maintain the same mood (colère) and sonorous parameter (dynamique) across all four works, Normandeau combines several element-actions, namely in the realm of texture (including density and dynamics). Normandeau describes this section as a montage, a concept borrowed from cinematography (Normandeau 1992). The expressive capacity of the montage lies in the juxtaposition of images — or in this case, sounds. Normandeau uses the juxtaposition of often intensely disparate textures to create a disjunctive temporal experience. Each sonic image lasts for an inconsistent and unpredictable length of time. Normandeau visually represents the montage effect in the listening score (Fig. 2): starting around 7:15, Normandeau includes small blocks, delineated by thick black vertical lines, indicating a strong gesture. The blocks are visually dense — a visual parallel to the sonic density. As the section progresses, the blocks become smaller and smaller: in less than one minute, Normandeau indicates twelve vertical gestures. The result on the ears is disjunction and aggression. The height of the boxes also indicates relative dynamic level, both in volume and density. Normandeau makes particular use of dynamics and articulations as textural activators in order to create a powerful expressive effect. In this section of Éclats de voix (7:15–8:51), Normandeau exploits the dynamics permitted by the new recording technology. Using the maximum dynamic range allowed by the equipment, the loudest sound is at 7:55 and the quietest is at 9:15; the range between the two is 60 dB (Normandeau 1992, 64). Figure 2. Listening Score for Éclats de voix. © Robert Normandeau, 1992. Used by permission of the composer. The same activators that Normandeau uses to shape the textual processes in section three also construct particular spatial boundaries and movement. Breaking out of the relative stasis of the second section, the third section immediately reminds the listener of the space constructed in the first section. The first section established a wide horizontal span as sounds panned at varying paces between the left and right channels. This reinforcement of the horizontal span through panning motion is effectively halted in the second section. Thus, in the third section, as sounds again pan quickly from left to right, and right to left, the broader spatial boundaries are re-established. The biggest spatial shift is achieved through an increase in dynamics. While not always a direct activator of the vertical span, these sudden dynamics raise the vertical span, contributing to a vigorous sonic experience. The constant changes in dynamic levels, and rapid and seemingly sporadic left-right panning create spatial uncertainty. The listener has no sense of constant space as it grows and shrinks without warning. In Le renard et la rose, the impression of a rising vertical span is further reinforced through the presence of ascending frequencies. As an immediate contrast, the spatial disorientation declines in the fourth section; sounds in this section remain static in the mix as Normandeau alternatively creates spatial contrast through the use of reverb and close-miking in his construction of four espaces: salle, intime, pièce, and extérieur. The third section provides a noteworthy comparison across the four works. The natural ranges of the variously aged voices create intense and dark sonic impressions. The third section, Colère et dynamique, contains the only mood that Normandeau keeps for all four stages. Perhaps he had written himself into a compositional corner in Éclats de voix. The montage effect, which is highlighted mainly through sudden shifts and unpredictable dynamics, timbre, and texture, would be hard to associate with many other moods — perhaps only other variants of anger (e.g., rage, fury, wrath). This recurring mood, though, offers a constant against which to examine Normandeau’s construction of anger in the various age ranges. In all four works, Colère et dynamique begins suddenly with sharp mouth sounds (many of which resemble Bédé) that break the silence and calm established at the end of timbre (section two). The increasing sharpness of the sounds in each subsequent work until Palimpseste is noticeable to the listener. In Éclats de voix, one can hear eight “instances of a ripping or splashing sonority derived from mouth sounds” (Berezan 1998, 6) using various phonemes, such as “s”, “sh”; they are somewhat reminiscent of the mouth sounds at 0:47. In each subsequent work of the cycle, the mouth sounds become more abstract, perhaps suggesting the kind of interiority anger takes as mature adulthood is reached. Adults may no longer scream, but their anger thrives in the emotional and psychological realms. Despite the similarities of the timeline, each work explores anger in a different way. Éclats de voix’s focus on childhood seems to naturally include anger, as children can be infamous for unpredictable tantrums. The erratic and quick spatial movement conveys a certain physicality, while the dissonant and ominous organ-like sound of the short dense bursts suggests a psychological aspect. The bursts are an assault to the senses, and they leave the listener feeling uneasy and uncomfortable. And then almost as quickly as the anger escalated, it dissipates. By 8:40 the dynamic level has been greatly reduced and remains subdued until the end of the section. The section then slowly dies away, with the fading of the organ sound. The volatile child has been placated. By contrast, the increased intensity of many of the sounds in Spleen establishes a darker, and sometimes more aggressive, mood. Normandeau’s own description of the voices as “raw” and “in the face” fits well with the stereotype of teenaged boys. Normandeau explained: “… because the boys were so much more energetic and rhythmic in the studio, I decided to push the boundaries a little bit: the sound is raw, the rhythms are more evident, more ‘in the face’” (Ogborn 2009). Because teenagers are also known for their fits of anger (i.e., rebellion), it seems appropriate to keep this same mood. The dynamics in this section of Spleen are similar to those in Éclats de voix. The sounds in Spleen at 6:43, though, are a bit sharper and somewhat more corporeal — one can hear the teeth, tongue and saliva. The sudden gesture at 7:25 is more intense than in Éclats de voix, with an increased lower frequency range due probably to the naturally lower voices of the teenaged boys. The various sound layers seem more prominent in Spleen, which, as a result, leads to a greater montage effect. This section more clearly invokes the human sound source, allowing the listener to construct a corporeal association with the emotion of anger. The aggressive sounds, spatial movement, and sudden dynamic shifts act as sonic analogies (or perhaps counterparts) for the physical and psychological experience of anger. This use of montage leads the listener simultaneously to identify with the human agent expressing psychological and emotional rage and to feel like the recipient of the anger with each unexpected assault on the ears. Normandeau extends this increased aggression into the fourth section. Though it starts in a similar manner to Éclats de voix, with the ascending slide up to droned pitches, in Spleen, Normandeau introduces a thunder-like low frequency growl (9:48, 9:57) that has no sonic parallel in Éclats de voix. The presence of this new sound constructs a darker and more aggressive character. The third section of Le renard et la rose retains the opening gestures established first in Éclats de voix, then reinforced in Spleen. The gestures are sharper than those in Spleen; the energy of these gestures creates an echo effect not heard in the previous two works. Normandeau increases the overt human presence in the opening of this section by including breath and discernible phonemes and words. In conjunction with breath, Normandeau further constructs a physical interiority with a low pulsing sound, like a heartbeat, beating with the regular lub-dub rhythm; this heartbeat begins with the first dense block at 7:24. At first the pace of this heartbeat is relatively slow, but, starting at 8:03, the heart rate increases at semi-regular intervals (8:13, 8:23, 8:31, 8:38). As the energy of the dense blocks dies away, so too does the heart rate decrease (8:47, 8:59) until the sounds fade to nothing. While the sudden shifts in texture and the energetic spatial movements in Éclats de voix and Spleen evoke a physicality in the anger, the anger constructed in Le renard et la rose is less jarring and extreme. Until this third section, Le renard et la rose has presented itself as an intensified version of Spleen. But at 7:24, with a gesture that signals the beginning of the juxtaposed dense blocks, the montage approach is less dramatic, with lower dynamic levels in particular. In comparison to this moment in Spleen, the effect is weaker. In fact the intensity of this section overall is less than what Spleen presents. Each vertical gesture in the score that indicates a new dense block of sound feels less jarring than the ones in Spleen. Perhaps adults’ anger is no longer the uncontrolled extreme emotion of adolescence. Adults must learn to control their anger. This internalization emerges in the heartbeat-like low pulsing sound, with the regular lub-dub rhythm. As Colère et dynamique progresses, the heartbeat increases its rate — the tension is rising; the anger is growing. But as any rational adult would experience, the anger fades and the heart rate slows down — the dynamic levels decrease, textures thin, and the juxtaposed blocks end. This third section is not as dramatic in Palimpseste as in the previous three works. The opening mouth sounds maintain the aggressive feeling first established in Spleen. However, while one might expect significant textural changes (namely in dynamics) starting at 7:23, as indicated by the vertical lines in the listening score, nothing of real significance emerges until 8:01. Rather, Normandeau constructs an aging body that, while perhaps angry, has resigned itself to this reality. Normandeau’s cycle poses a compelling challenge to formal analysis. Each work in the cycle consists of five movements. Each section lasts between two and four minutes, and, as the program notes indicate, the work may be played in its entirety or as an individual section, making each work more adaptable to radio transmission. 3[3. The program notes for Éclats de voix and Spleen make specific mention of the possibility to isolate sections for radio play; the program notes for Le renard et la rose and Palimpseste do not mention this possibility. When asked to clarify this statement, Normandeau explained: “Each section is almost self-contained or self-sufficient up to a point. But I never play an excerpt of these piece[s] personally…” (Normandeau 2011). He felt that only the first and fourth sections would lend themselves most naturally to isolated performances.] This simultaneous aim for small- and large-scale transmission poses several questions for the analyst: How exactly do the formal processes play out in each section, and also in the entire work? Has a narrative trajectory been eliminated with the fragmented playback option? Can large-scale formal processes achieve a coherent, unified expressive end when the work was conceived in both union and fragmentation? Berry suggests that form may be allocated into various roles including introduction, statement and conclusion (1987, 6). As the first section in a five-section work, rythme could act as an introduction or first statement to the rest of the work. Indeed it introduces many elements of the sonic landscape. But if played as a discrete piece, the first section, and thus its formal divides, changes. The first minute or so becomes the introduction, but this opening subsection does not establish the pacing of the rest of the section, particularly in terms of rhythm, which is integral to the sonic environment. In addition, as a relatively short introduction, this opening minute does little to establish the sonic environment; its principle sounds do not emerge in the rest of the section. Perhaps if the first section were played alone, this opening minute would more closely resemble the slow introductions of classical (i.e., approximately 1750–1830) first movements. To help establish the uniqueness of each work, Normandeau included an additional introductory element in each of the last three works in the cycle. In Spleen, the opening seconds resemble saw-like sounds; Le renard et la rose has laughter; and Palimpseste has a sound like a creaking door. 4[4. Normandeau explained that the opening sound of Spleen combines the energy profile of a coin spinning, which gradually picks up speed before falling, with the voice; it is a reference to the opening of progressive rock band Gentle Giant’s song “The Boys in the Band” from Octopus (1972).] These three alternative beginnings disrupt the timeline first established in Éclats de voix; these new sounds become something of a new introduction. Alternatively, they act like a pick-up, or an anticipation of the real introduction. Then it is only when the real introduction ends at approximately 1:00 that the listener realizes the statement has finally arrived. Anticipatory and introductory statuses are granted retrospectively. Berry’s concept of conclusion at first seems to fit neatly with the fifth section, as it recalls sonic elements introduced earlier in the work. But in one significant way it defies definition as a conclusion. If this fifth section is played alone, then only part of the section can be a conclusion. How can something be both statement and conclusion? Recall that according to Berry, formal processes rely on contextual shaping. Thus perhaps it is reasonable that the fifth section will develop in different ways if played following the other four sections or alone. However, one must question whether it can be expressively convincing in both contexts. For example, in Le renard et la rose, a fragmentation of the work into discrete sections would erase one of its most significant sonic motifs: laughter. By inserting laughter intermittently, laughter becomes a motif whose timbral intensity arches over the entire work. Without a reference to the laughter in other sections, this powerful sonic marker diminishes in its expressive potential. In musical formal processes, the climax is often reached after a period of increasing dissonance, tonal or otherwise (like in a development section), followed by a moment of release or resolution. The third section, Colère et dynamique, creates the greatest sense of dissonance in texture, timbre and time. This dissonance is achieved through high dynamic levels (the highest in the whole work), density-numbers, and unpredictable pacing, that is, montage. But resolution is achieved neither through a large consonant culmination nor a peak. Rather, like many other sections of this work, the dissonant intensities slowly decline, dying away particularly as the dynamic levels decrease. This tendency towards energy decline is further highlighted in the overall tone of Palimpseste. In stark contrast to all three previous works, Palimpseste exhibits an almost complete absence of pulse and drive. Palimpseste opens with a sound that resembles a creaking door; the sound creates the impression that the moving of this door requires incredible effort. This impression of effort sets the tone for the rest of the work; the work makes the listener really hear the effort required in these sounds. When the section begins with the cycle’s timeline at 0:07, it is already easily apparent that the energy and vitality expressed in the previous three works (with increasing effect in Spleen and Le renard et la rose) is either gone or greatly diminished. In the first 50 seconds, the drop in energy is unmistakable, suggesting a comparatively lethargic mood. At 1:10, when the pulse was aggressive in the previous two works, the pulse and rhythmic patterns are present, but they are subtler and certainly not the focus. The decrease in overall energy suggests that the vocal source seems unable to sustain the vocal energy of the adolescents and adults. Sounds move more slowly, both internally and externally. The whole work seems to fade to nothing, as opposed to the previous works that seemed to gain momentum for much of the work. The exhausted body of Palimpseste suggests an ultimate kind of exhaustion that leads to death. The body’s health and strength fades, which, here, is constructed through attack-decay profiles whose onsets are weaker, continuants are briefer (or non-existent) and terminations are quick yet subdued. This cycle’s tendency towards energy decline, which is most prominent in throughout Palimpseste, then becomes an alternative formal approach to climax and denouement. Berry’s concept of structural functions is a potential tool for exploring some of the multi-layered formal processes at work in Normandeau’s Onomatopoeias cycle. By focusing on the most significant elements (i.e., texture, timbre and space), these preliminary examples have only begun to unpack what is the analytical potential of Normandeau’s cycle. As brief case studies, this analysis may also open up a discussion regarding the application of Berry’s formal processes to future analyses of electroacoustic music. Berezan, David. “Robert Normandeau’s Éclats de voix: An Analysis.” Unpublished Master’s Thesis. University of Calgary, 1998. Berry, Wallace. Structural Functions in Music. Mineola, NY: Dover Publications, 1987. Lane, Cathy (Ed.). Playing With Words: The Spoken Word in Artistic Practice. Manchester UK; Cornerhouse Publications, 2008. Licata, Thomas (Ed.) Electroacoustic Music: Analytical Perspectives. Westport CT: Greenwood Press, 2002. Normandeau, Robert. “Un cinema pour l’oreille: cycle d’oeuvres acousmatiques incluant ‘Éclats de voix’, ‘Jeu’, ‘Memoires vives’ et ‘Tangram’.” Unpublished Doctoral dissertation. Université de Montréal, 1992. _____. “… et vers un cinéma pour l’oreille.” Circuit 4/1 & 2 (1993) “Électroacoustique-Québec: L’essor” (Guest Ed. Francis Dhomont), pp. 113–126. _____. Personal Interview. 8 February 2011. Reed, Tim. “I. Planes of Discourse in Fixed Media Electroacoustic Music: A Comparative Study and Application of Analytical Approaches, and, II. Three Movements for String Orchestra.” Unpublished Doctoral Dissertation. University of Florida, 2008. Roy, Stéphane. L’analyse des musiques électroacoustiques: Modèles et propositions. Paris: L’Harmattan, 2003. Simoni, Mary (Ed.). Analytical Methods of Electroacoustic Music. New York: Routledge Taylor and Francis, 2006. Smalley, Denis and Lelio Camilleri. “The Analysis of Electroacoustic Music.” Journal of New Music Research 27/1 & 2 (1998) “Analysis of Electroacoustic Music,” pp. 3–12. Windsor, W. Luke. “A Perceptual Approach to the Description and Analysis of Acousmatic Music.” Unpublished PhD Thesis. City University, 1995. _____. “Through and Around the Acousmatic: the Interpretation of Electroacoustic Sounds.” Music, Electronic Media and Culture. Edited by Simon Emmerson. London: Ashgate, 2000, pp. 7–35. Alexa Woloshyn hails from Saskatoon, where she completed a Bachelor of Music (University of Saskatchewan, 2005) and actively performed as a pianist and singer. She completed her Master of Arts in Musicology at the University of Western Ontario (2007) before heading to the University of Toronto for her doctoral studies in musicology. Her dissertation focuses on the voice and the body in contemporary Canadian electroacoustic music by Christian Calon, Robert Normandeau, Tanya Tagaq, Barry Truax and Hildegard Westerkamp. Alexa gratefully acknowledges the support of a Social Sciences and Humanities Research Council Doctoral Fellowship. 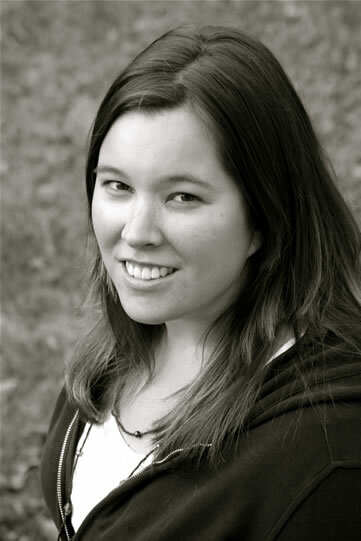 Her other research interests include electronica singer-songwriters Björk and Imogen Heap, and Canadian popular music. Alexa frequently returns to the prairies to visit family and perform with her indie folk band JJ Atrio.